The book Haliburton by Rail and the I. B. and O. by Taylor Wilkins is a wonderful collection of local railway history. 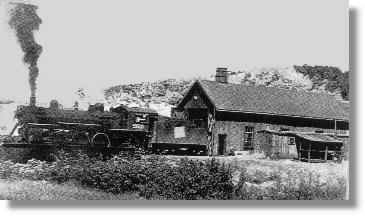 That railway was an integral part of Haliburton Scout Reserve’s early history. When Camp Kennabi first opened in the late 1940’s, many, if not most groups headed east from Toronto Union Station by steam-powered passenger train. They eventually turned northward to Lindsay where they disembarked, crossed the station platform and then boarded the mixed train for the Town of Haliburton. the steam engine was probably CNR #5610 (p.74), a Pacific type with a 4-6-2 wheel arrangement. It was built in 1910 and scrapped in Dec. of 1955 (p.74). It pulled a mixed train (freight and passenger) that might include: an express/baggage car, a passenger coach, a box or freight car, a flat car, a tank car and possibly a caboose. These old, often wooden-bodied cars, varied in type and number, but invariably included a coach. We are told that “Passenger service to Haliburton was discontinued in 1961. Actually, there had not been a true passenger train up to that time, as passenger service was given by including a passenger car in the way freight trains.” (p.68). Our troop (135th Toronto) came by mixed train several times between 1948 and the mid 1950’s. I was surprised to discover that the steam engine on display in front of the Haliburton District High School was not, as the name on the tender designates, …”The Highlander” (p.72). It is without a doubt, an impostor. Back in the 1930’s, the original train called the “Highlander Weekend Special” (p.72) was pulled by “Locomotive C.N.R. 649 …built by the Grand Trunk Railway in their shops at Point St. Charles, Montreal, in 1896. It was of the small Mogul type with wheel arrangement 2-6-0 …” (p.72) We learn that “The train fan from Toronto to Haliburton on Saturdays in the summer and returned on Sunday(s).” (p.72) Engine #649 was the genuine Highlander, but it never pulled a train with Kennabi campers aboard, into Haliburton Station. It “…was scrapped August 1940.” (p.72). The engine “…on display near the High School … CNR locomotive 2616 was built for the Grand Truck Railway by ALCO – The American Locomotive Company at its Brooks Works at Dunkirk, N.Y. in 1911…” (p.72). (N.B. a built date of 1891 is also given for #2616 on the same page). We are told that “2616 … was of the Consolidation type with wheel arrangement 2-8-0…” (p.72). this engine “…ran on the Belleville to Lindsay run, and it did not get to Haliburton until it was retired.” (p.72). It was then “…purchased by the Rotary Club of Haliburton in September 1960…” (p.72) from the Canadian National Railways. 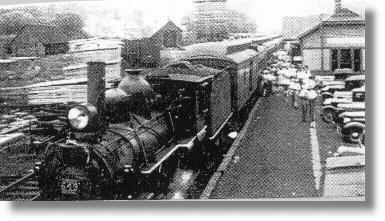 They then “…displayed…” the locomotive “…next to the High School.” (p.72). They took an American built Ten Wheeler and substituted it for a Canadian built Eight Wheeler and labelled it The Highlander” (p.72). Locomotive #5610 would have been a reasonable stand-in for #649. Locally it would have been recognized as having operated between Lindsay and Haliburton for many years. It was not perfect since it would have been a Twelve Wheeler substituted for an Eight Wheeler. Even #5610 was not The Highlander but perhaps it could have been accepted as A Highlander. Sadly C.N.R. #5610 had been scrapped in Dec. ‘55, 5 years before the Rotary Club decided to put an engine on display. They accepted #2616 and wrongly labelled it. Incredible, but nevertheless true, the impostor has sat on display for over 40 years and it would seem, unchallenged. It not even once, pulled into Haliburton Station. In defence of #2616, The Impostor, we can state that it is a fine piece of antique machinery, and …a real …steam engine. How many people, HSR. alumni included, have viewed locomotive #2616 over these many years, in the wrong light? The exact year may now be lost to my memory but not so that day’s events. It was a warm Saturday in August and the 135th Toronto Scout Troop, in full uniform as required, was on its way to Camp Kennabi. It was 1949 or 1950 our second or third camp in Haliburton. We were on the train wending our way through the farmland, somewhere between Lake Ontario and Lindsay. Due to the heat, the windows were all up. Far up ahead of us, the engine belched a steady column of smoke, that rose at first and then streamed back in a cloud to settle over the fields on the one side of the train. As the track curved, that black haze came closer and closer to the coach. I can still hear the cry “Windows!” They were all closed just in time. Soon the track swung back in the opposite direction and the windows were all quickly raised. What may have started as a game, soon became accepted as a necessary routine. In spite of our efforts the coach became covered in fine dust. fingers soon transferred black smudges from window sills and seats to the white borders of our bed and blue scarves. Dirty faces come to mind as well. Being in the last coach had its disadvantages. No coach was totally safe but the sooty smoke did tend to pass over the first few cars. Last coach in a train had the advantage of a clear view, at times, to the rear. You could stand in the back vestibule with only a folding chain gate across the doorway. Early that day a couple of friends and I had watched the city fade into the distance. The tallest structure back then was the Bank of Commerce building, and it was the last of Toronto to disappear on the western horizon. The distinct click of the wheels over the rail junctions made us quite aware of our slow but constant speed. The slightly noisier clatter as we passed over a switch, broke the rhythm from time to time. Our coach had a compartment at the rear, called a smoker. About three-quarters of the car was centre-aisled, but at the back it jogged to the one side, against the windows. The smoker had glass windows and a door on the aisle and regular windows on the other side. That very neat compartment seated perhaps 8 people. A Toronto Rover Crew of about 6 or 7 boys occupied it as a temporary den and rehearsal hall. They followed B.P.’s advice in Rovering to Success … they did not smoke. They just talked, laughed and sang. Soon they joined the two dozen scouts in the main coach area in one great sing-song. Both groups supplied a song or two new to the other. I do recall learning additional verses to one of our familiar songs as well. We all had fun. At some point, still south of Lindsay, that crew introduced us to a new song with 12 verses. It was destined to have a lasting effect on the 135th. They willingly repeated verses and explained meanings not immediately clear to us. by the time we changed trains at Lindsay we had the song down pat. By the time we reached Kinmount, Tom Corner our S.M., must have been beside himself. Perhaps around Gelert or Lochlin, those poor rovers must have wished that there had been a smoker to den up in. At last we pulled into Haliburton Station. At last we were tired of repeating that song. Surely we had sung the tune for the very last time. Backed into the platform were two bright yellow 1942 army trucks, our mode of transportation for the last dozen miles. Awaiting us a Camp Kennabi were two Group Committee members with our gear on a rented truck. Both trains had been slow and both of the old Chevrolet trucks even slower. the trip down the lake by Queen (large lifeboat) to Big Bear Point, the slowest. Each night around our campfire on the beach, we performed our skits and sang our old songs. We sang one new song as well each night. We had learned it on the trains following the route of the famous… Highlander. It was not however… I’ve Been Working on the Railroad…. It had 12 verses. We sang… Green Grow the Rushes Oh! PLEASE FORWARD TO F. BRUCE RYANS. Bruce, you wouldn’t be the son of Fred Ryans by any chance? I spent many summers myself in Haliburton at the family cottage and really enjoyed your article on the Highlander. If you are indeed Fred’s son, I am married to your first cousin, Jo-Ann Ambrose. Anyway, enjoyed the train story. A very interesting read! The history is amazing. To think that similar trips are being made today by car and bus. A marvelous place for one and all.